Q. Is it better to turn off the appliances before turning of the generator or should the generator be turned off under load? A: Yes, Both are OK and neither will harm the generator or the appliances. So much for the pro and cons to this perpetual question. In the final analysis it does not seem to matter. Whatever you prefer is OK by Onan. Q. If I am traveling through the mountains do I make any adjustments to the generator? A. Yes, on the bottom of the carburetor bowl there is an adjustment that is set to the altitude above see level. Adjust it to the height shown, rotating to the right leans the mixture which is what is required as you increase altitude. Q. Can I run my generator all night or all day? A. Yes, Onan generators are rated for continuous use provided that you have a Carbon Monoxide (CO) detector. Many such uses were noted during the Midwest flooding and hurricanes and tropical storms in the south. RV generators provided critical emergency power while power lines were being restored. Q. 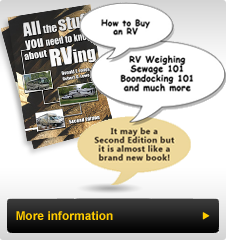 Do you own a motorhome? A. 1990-1/2 Bounder (not the Classic). We live in California and regularly travel to Baja, Mexico. The rig bounces, shakes and rattles and you think it will never be the same, then you return to smooth pavement and it is as solid as new. Great rig. Bill Murphy confirmed what we were told by Fleetwood's Nick Palm that a true Diesel Bounder is in the late stages of development. It will be built on a Freightliner Chassis and will not be a Discovery cheapened up, but a unique, newer style Bounder with all of the features Bounder are known for. Bill said that Onan would be supplying a quiet Diesel generator with some automated features to Fleetwood for the Diesel rig. Word has it that the new rig is about a year away. Ford will introduce an 18,500lb. GVW chassis with the new Duratec V-10 engine and Bounders will be available in January on this chassis. Pre-production testing done on Ford's test track using Fleetwood coaches indicated excellent durability, and even Ford engineers were surprised how well the Fleetwood bodies stood up to the very rough roads and abusive treatment given to these rigs in their accelerated durability testing. At the time of the Rally, Fleetwood were a couple of weeks away from receiving these rigs back to their labs for disassembly and inspection. Chevrolet is no longer producing the lower power (230hp) 454, all 1998 chassis are equipped with the 290hp engines. According to Fleetwood the same durability testing that Ford puts their chassis through produces a broken front spring in Chevrolet chassis every 7,000 miles and 9 springs are replaced in the course of the durability testing. Over the past three years, this pattern has been consistent. Two thoughts came to my mind: If this is what happens in the durability testing, what has been the experience in day-to-day use? Has anyone ever experienced a broken spring on the Chevrolet Chassis? Secondly, if this has occurred for three years of testing, would it not seem logical that Chevrolet would make changes to the design of the springs and/or chassis? I guess the answer will come when the replacement Chevrolet Chassis is introduced in the next year or two.